Investigations of the sun's fiery outer atmosphere will intensify when the Ulysses spacecraft passes behind the sun on Wednesday, August 21. "A spacecraft such as Ulysses, which is slightly above the plane of the Earth's orbit, will appear to pass just above the sun," said JPL's Dr. Edward J. Smith, project scientist for NASA, which is managing the mission jointly with the European Space Agency (ESA). "At conjunction, radio waves transmitted from the spacecraft will travel through and become distorted by the inner-most region of the corona." Conjunction will occur when the spacecraft and Earth are on opposite sides of the sun. Signals sent from the spacecraft to Earth during this alignment will be distorted by the denser part of the sun's outer atmosphere, known as the corona. While interference from the conjunction will temporarily degrade communications with the spacecraft, the alignment will create an ideal situation for radio science experiments, added Dr. Edgar Page, ESA science coordinator. the sun's corona at four solar radii -- 2.9 million kilometers or 1.8 million miles -- from the center of the sun. Scientists are interested in studying the innermost layers of the corona, where gases are particularly thick and dense. Subtle changes in the character of the radio waves reaching Earth from the spacecraft will be examined to provide information on the hot gases through which the waves have passed. The Solar Corona Experiment, one of two radio science experiments using the spacecraft's two radio transmitters, will study the density, velocity and turbulence of the solar atmosphere. Dr. Michael Bird of the University of Bonn, Germany, is the experiment's principal investigator. "This radio probing of the corona provides an opportunity to obtain information in solar regions where no spacecraft has flown," Smith said. "The Ulysses flight path is particularly favorable scientifically because the radio waves will travel through a region of the corona in which the solar wind is thought to originate." The mission operations team at Jet Propulsion Laboratory said routine maneuvering of the spacecraft will not be possible for about 15 days during the solar conjunction. "The spacecraft has been placed in a mode to operate autonomously during the conjunction," said Peter Beech, ESA mission operations manager. "The automatic conjunction mode allows the spacecraft to carry out pre-programmed computer instructions necessary to maintain on-board operations." Once the spacecraft has moved away from the sun, ground controllers will reestablish routine commanding and begin to acquire the new data. The Solar Corona Experiment will continue to operate for about two weeks after solar conjunction. Ulysses is presently traveling just above the ecliptic plane -- the plane in which the Earth and sun orbit -- on its way to Jupiter. 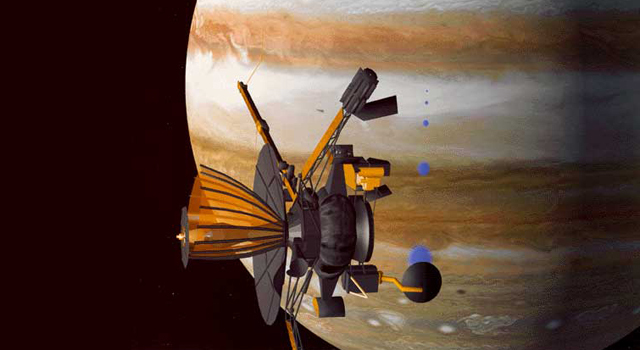 On February 8, 1992, the spacecraft will fly by the planet at closest approach of about 235,000 miles above the cloud tops, using the gravitational pull of Jupiter to swing itself out of the ecliptic plane and onward to the poles of the sun. Ulysses is a five-year mission to study the poles of the sun, managed jointly by NASA's Office of Space Science and Applications and the European Space Agency. The spacecraft will begin its primary science objectives in June 1994, when it reaches 70 degrees south solar latitude. Tracking and data collection during the mission are provided by NASA's Deep Space Network, which is managed by the Jet Propulsion Laboratory.